In France, children celebrate the first day of April by pining paper fish to people's back, hoping they won't notice. I wish I was in Paris today , just for the sheer fun of it. 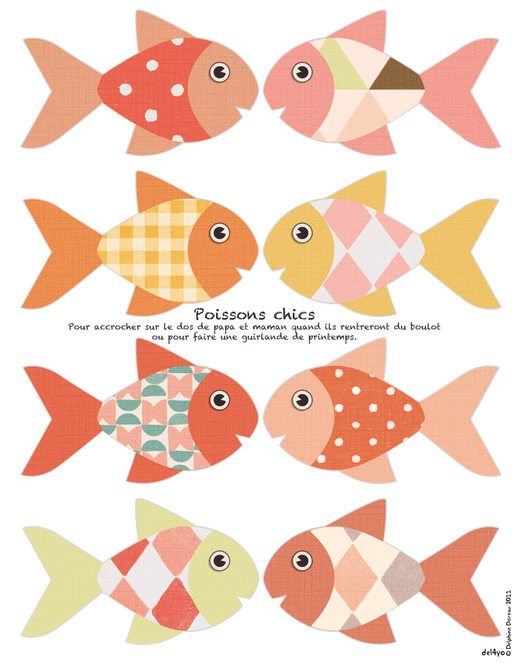 In 2011 I created some cute fishies to hang or play with...This year I updated them with fresher, up to date colors. Have fun with a French April Fool's Day ( very Anthro, quoi?? ), or make a cute April's bunting. Enjoy! Personal use only, don't redistribute. Please link with Facebook and Pinterest! Des poissons très 2013 pour compléter ceux de 2011....Frais pour la saison, se porte au dos. Veuillez assortir avec vos robes pulls de printemps pour un effet très fashion.